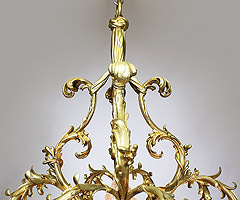 A Very Fine and Rare French Belle Epoque 19th/20th Century Nine-Light Gilt and Enameled Bronze "Bouquet" Chandelier. 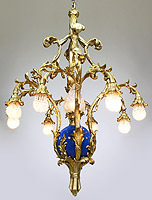 The floral scrolled gilt-bronze frame formed in the shape of a floral arrangement suspended by tied tassels, surmounted with eight branches facing downward with beaded glass bulb covers, the center with blue enameled bronze oil-container sphere topped with a frosted glass shade in the shape of a burning flame. 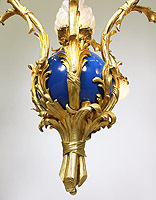 The sphere surmounted with tied branches and acanthus forming the end of a bouquet. Circa: Paris, 1900. 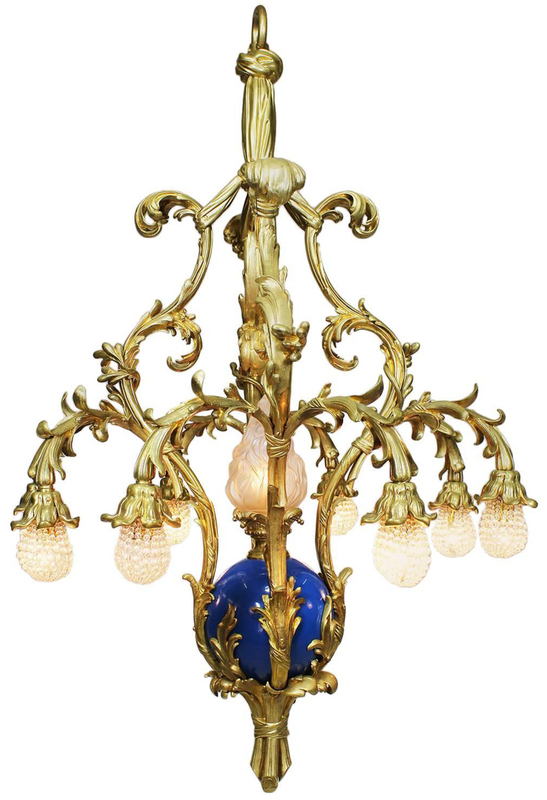 A Very Fine and Rare French Belle Époque 19th/20th Century Nine-Light Gilt and Enameled Bronze "Bouquet" Chandelier. 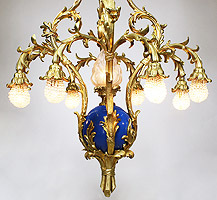 The floral scrolled gilt-bronze frame formed in the shape of a floral arrangement suspended by tied tassels, surmounted with eight branches facing downward with beaded glass bulb covers, the center with blue enameled bronze oil-container sphere topped with a frosted glass shade in the shape of a burning flame. The sphere surmounted with tied branches and acanthus forming the end of a bouquet. Circa: Paris, 1900.